Pluto may have a polar ice cap. This is the tantalising prospect revealed in the latest images to come down from the New Horizons spacecraft. The US space agency probe is en route to the dwarf planet and is set to make a close flyby on 14 July. Pictures taken from a distance of just over 100 million km display regions of varying brightness. But it is a persistent light patch that catches the eye, which scientists say could be nitrogen ice on the surface. 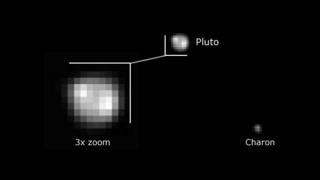 The diminutive world remains blob-like in the images, even though it is being seen through New Horizons' powerful Lorri telescope. Nonetheless, this is the best ever view we have had of Pluto, says mission principal investigator Alan Stern from the Southwest Research Institute. "These images are just a little bit better than anything that has ever been obtained in history," he told reporters. "We on the New Horizons team feel a little bit like ocean mariners, explorers crossing between continents - weeks and weeks on the ocean in their case, nine-and-a-half years in our case. We can finally see the shore. That's land ho! And the images are only going to get better and better from hereon out." New Horizons was launched from Earth in 2006. Since then, it has crossed some 5 billion km of space. It is travelling so fast that it will not actually be able to get into orbit around Pluto when it arrives, and will have to grab as much data as possible as it barrels past the 2,300km-wide dwarf and its moons. The rendezvous will complete the reconnaissance of the "classical nine" planets of our Solar System. New Horizon's flyby will mean all have been visited at least once by a space probe. However, not since Voyager 2 passed by Neptune in the late 1980s has a new world been revealed up close in quite the same way. To date, the imaging that New Horizons has done has been largely for navigation purposes - to ensure the probe is maintained on precisely the right trajectory. But increasingly, as their resolution improves, the pictures can be used to do scientific study. From 28 May, the spacecraft will be acquiring them daily. And in a move that is sure to delight space fans, the mission team says it intends to display them all on a public website. "These images are going to be posted for your pleasure and viewing within 48 hours typically of them landing on the ground," explained Hal Weaver, from the Johns Hopkins University Applied Physics Laboratory. "We hope you can share in the excitement. By the time we get to the closest approach to Pluto, it's going to blow us all away." For now, researchers can only speculate as to the cause of some of the variations in brightness seen in the current pictures. They may have something to do with the geology at the surface, some compositional differences or perhaps just changes in topography. "It's rare to see any planet in the Solar System at this low resolution display such strong surface markings," commented Prof Stern. "Even if you had similar images of Mercury or even Mars, for example, you would not see the same kinds of big surface units as you do here on Pluto. And that's really promising for the imagery as we get closer and closer." Scientists discerned through telescopic observations in the 1980s that Pluto had a thin atmosphere made mostly of nitrogen. The expectation is that this gaseous envelope seasonally snows out on to the surface of the dwarf, which makes a polar cap a realistic proposition. New Horizons' flyby observations in July will determine definitively whether this is the case.